This avocado bacon salad with spinach has a delicious honey mustard dressing that perfectly complements the crispy bacon and creamy avocado. I love eating salad year-round, but obviously people tend to eat them more in the summer, so I plan on getting some more salad recipes up here in the next few months. Stay tuned. This crispy bacon and avocado salad recipe is perfect for a hearty entree salad (it’s quite filling), but it would also work great as a side salad. The pretty colors and bounty of veggies (and bacon and cheese haha) would make this the perfect crowd-pleasing salad to bring to a BBQ or potluck this summer. 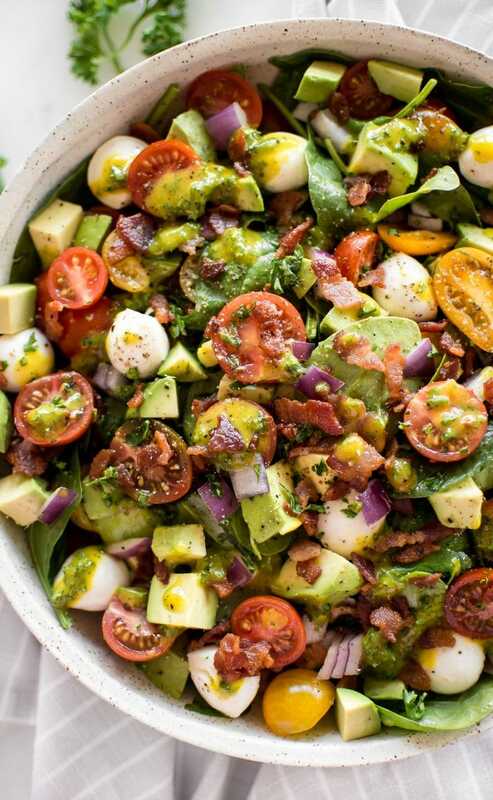 This avocado and bacon salad is loaded with plenty of other tasty morsels – mini bocconcini (mozzarella balls), sweet little tomatoes, and red onions. The honey mustard dressing can be whipped up in a flash. The flavors are a popular family favorite, and the chopped parsley that I added to it gives it a burst of freshness. Hope you love this easy avocado bacon salad recipe! Will you make it? Cut bacon into small pieces (I use kitchen shears to make this easy) and add it to a skillet over medium-high heat. Fry until crispy (about 10-12 minutes). Once it's cooked, discard the fat or save it for another use. Add the dressing ingredients to a small bowl and whisk until combined. As always, adjust salad dressing ingredients to your tastes (e.g. add more lemon or oil). Serves 2 as a main course or 4+ as a side salad. Love bacon in salad? You may also like my spinach salad with bacon and eggs. Since I got you that bowl for your birthday, the least you could do is make me this salad but without bacon. Are you going to? You made me snort with that reply. Just what my sister would have said! Also love the bowl, and am going to make the salad for tonight’s dinner with some added grilled chicken breast. My stomach’s growling at the thought right now. Your pictures really sold this! Haha sisters are the best, right?! Thanks! I really like it too! I hope you love the recipe!! Grilled chicken would be an excellent addition. Yes I will make this salad, Natasha! Obsessed with all these flavors together. Pinned for my next BBQ! That’s great! Thanks, Tracy. Hope you like it! Natasha, Love your site and love all these healthy salads.